I've been thinking today about the little things that are beautiful and wonderful, like this tiny little linaria blossom that is only about 3/8 of an inch (7 mm) tall. This tiny little blossom would go unnoticed if I didn't look closely. And it is so exquisite with its deep burgundy red petals and yellow and white throat. 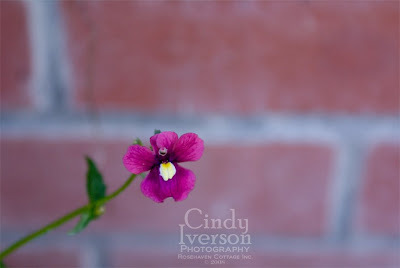 It looks like a teeny tiny snapdragon to me. Despite its diminutive size, its a hardy little thing having wintered over in a pot in the front garden. I didn't expect it to still be here. It was just one of those plants I bought to fill in a mixed container planting arrangement. Interestingly, everything else in the pot except the heuchera and the linaria is long gone. I've been outside in the back garden the past two days sledgehammering concrete for a major project I've undertaken. I truly enjoy this sort of manual labor because it is so basic and simple. I can swing away at the concrete and then throw the big chunks around. In the end, I get a great deal of satisfaction from something so basic. Being a time-consuming task, this manual exertion also affords me the opportunity to spend hours in my favorite place in the whole world--my garden. As I work, I am aware of the little things around me like the earthworms that I find under the concrete pad I'm breaking up. I take the time to gently pick each one up, put them in a small pot of dirt specifically intended for earthworm rescue, and then I transfer the earthworms to my vegetable planters when I get enough in the little pot. Why is it that finding earthworms and putting them in my vegetable garden is such a fulfilling thing for me? It's such a little thing, but has such big rewards for me. And as I sit here and type this, yet another little thing is making me very satisfied and content. 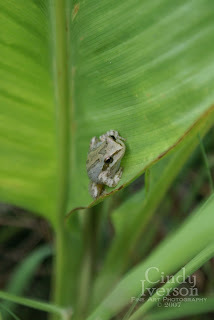 My studio windows are open, letting in the sounds of Pacific tree frogs ribbeting and croaking by the pond. I marvel at how such tiny little creatures can make such big sounds. Each one is less than an inch long (about 20 mm), but they make such an impressive sound. As they serenade me with their annual nighttime mating calls, I find myself feeling very grateful for all the little things that make life rich and rewarding. Beautiful post Cindy. It's the little things in life, whether it be nature or something else, that make it so much more rich and fulfilling. this is the only blog i have read where i can't seem to find a date on the posts. if i am missing something obvious, could you please point me in the right direction? This is a wonderful post, Cindy. You are on to something with the earthworms rescue and how it makes one feel so good. That little linaria is tough, who would have thought it could survive? I will have to try them! And that sweet little froggie, too precious. Thanks for a thoughtful story. But I worry about your arms and back with that sledge, yikes, it hurts just to think about it! For some bizarre reason my blog doesn't post the dates. No matter where I go in my layout settings, the dates don't show. Weird isn't it? yes... the little things are so lovely and open windows - ahh I remember those. It's so wonderful to read your musings. As you can see from my post today, things are very different here, beautiful, but very different. Cindy, I'm so happy I visited today~I've been feeling the same way, enjoying the little things! A rich and rewarding post, Cindy, to use your words! You feel that way because the spiritual/artistic side of you is well tuned! I know how you feel. I could dance when the rainbow comes through the prism in my living room window, just at spring and fall. Little things make our days worth living! Thanks for sharing your joy!